Directed by Marcos Najera Featuring musical collaboration with Louie Perez of Los Lobos, CAVA and Walter Miranda ¡Ser! is a riveting personal narrative that examines a queer Latina’s strained relationship with each of her two homes: Los Angeles, and Buenos Aires. Spending years in both of The Americas, she constantly dreams of a pilgrimage to meet her soccer idol Diego Maradona and see him play. The back and forth migration of her upbringing, amidst major moments in Argentine history, leaves her with few role models save for an over-sexed Argentinian English teacher and a mute that communicates via horn. 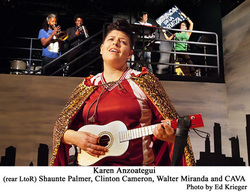 Using inventive theatrical strategies such as casting James Brown in the role of her abusive father, live music, and her own soccer skills, Karen delights audiences. Watch her remove negative influences from her life to find community and love in pursuit of her ¡GOL!